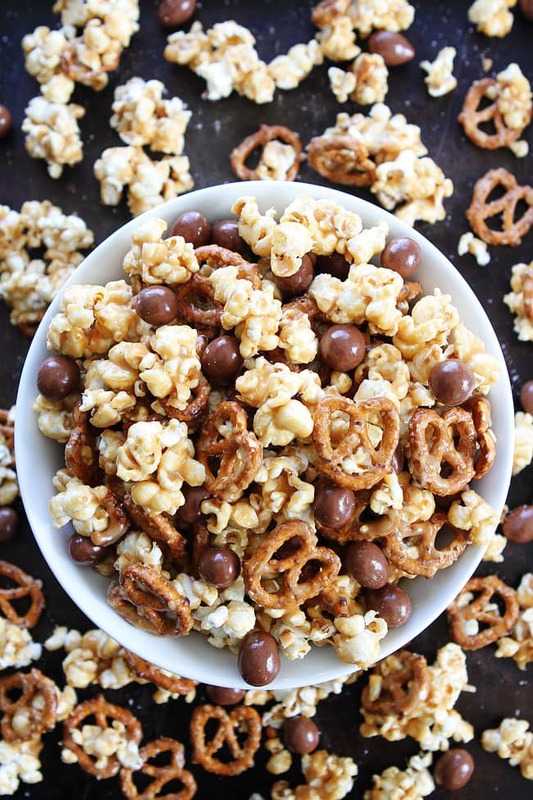 Peanut Butter Pretzel Caramel Popcorn-peanut butter caramel corn with pretzels and Lindt HELLO Pretzel Bites. 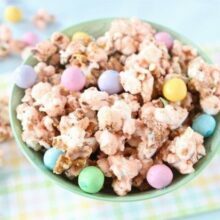 This sweet and salty popcorn snack is addicting! 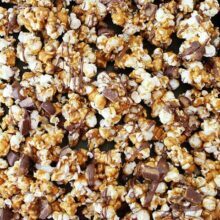 Ok, I know it is the new year and people are trying to exercise and eat healthy, which is good and all, but you have to take a break from your salad to make my Peanut Butter Pretzel Caramel Popcorn. You see, the Golden Globes are on Sunday and that means it is party time. You can’t watch the award show without party food and this sweet and salty popcorn is amazing! 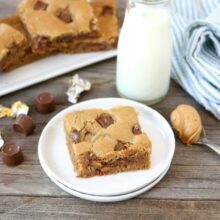 You need to add it to your party menu right now! Popcorn and pretzels get drizzled with a sweet, sticky sauce that is made with honey, sugar, peanut butter and vanilla. 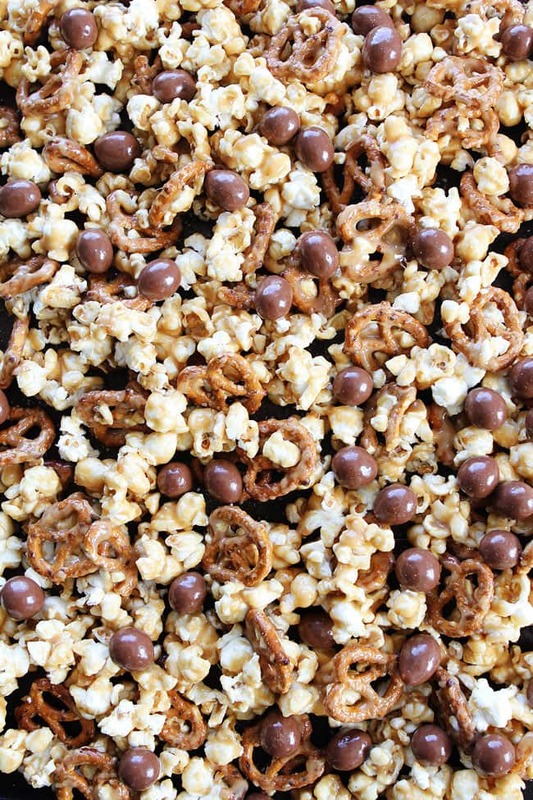 Toss until the popcorn and pretzels are well coated, sprinkle with salt, and add in Lindt HELLO Pretzel Bites. They are the “diamonds” for our party popcorn. They add some major bling! 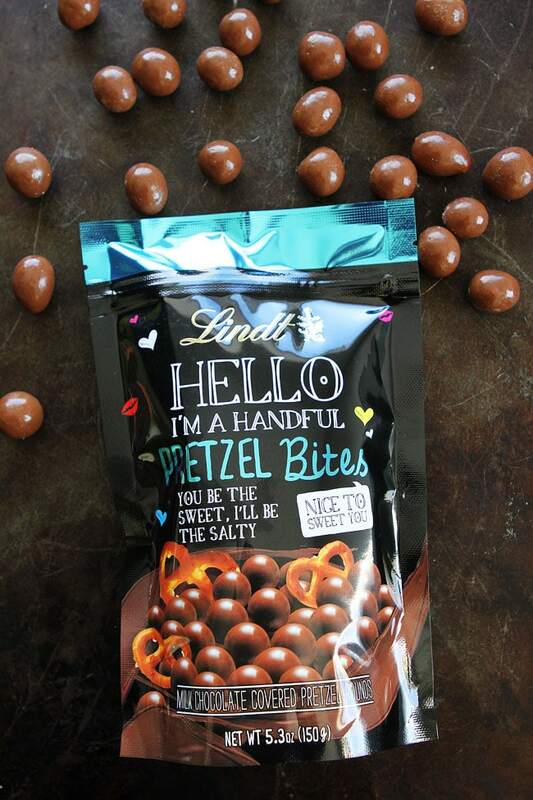 The Lindt HELLO Pretzel Bites are little pretzel rounds covered in milk chocolate. They are SO good and the perfect finishing touch to the popcorn. I love the sweet and salty combo! If you can’t find them, you can use malt balls or Milk Duds. They are good too! Make sure you join in on the Golden Globes fun on Sunday and don’t forget the Peanut Butter Pretzel Caramel Popcorn! 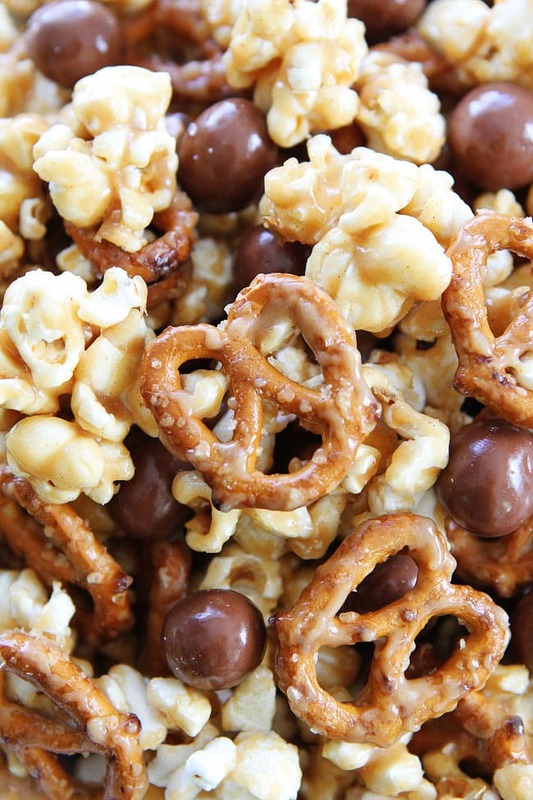 Peanut butter caramel corn with pretzels and HELLO Pretzel Bites. This sweet and salty popcorn is perfect for parties, game day, movie night, and every day snacking! Place the popped popcorn and pretzels in a large bowl and set aside. 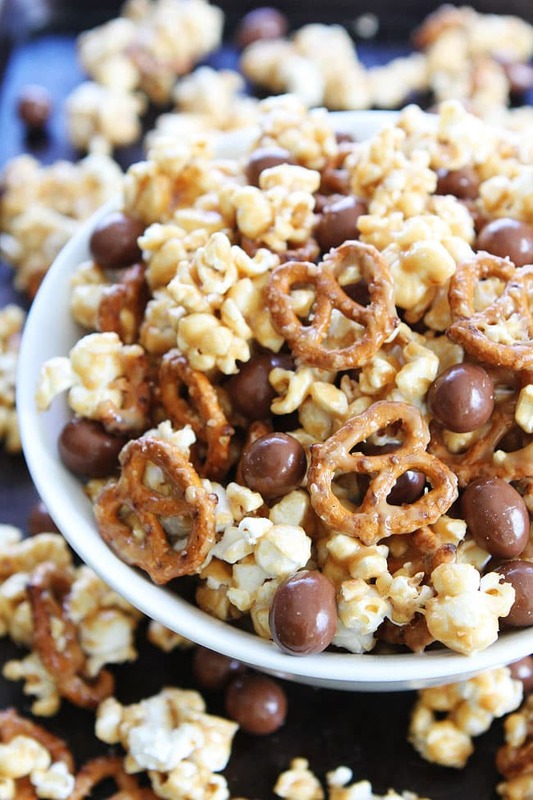 Immediately pour the peanut butter caramel over the popcorn and pretzels. Gently stir until well coated. Season with salt, to taste. Stir in HELLO Pretzel Bites. Serve! Note-We used air-popped popcorn, but you can use microwave popcorn or stovetop popcorn. Disclosure-this post is in partnership with Lindt Chocolate, but our opinions are our own. Thank you for supporting the brands that continue to make Two Peas and Their Pod possible. I would probably buy these for the packaging alone! But those Pretzel Bites sound especially awesome! Oh my goodness! Those pretzel bites sound fantastic! I’m sure they are great in the snack mix, but I would certainly eat them by the handful before getting them into the recipe. I am so excited for Sunday! I am working with Lindt as well and hosting a at home view party! 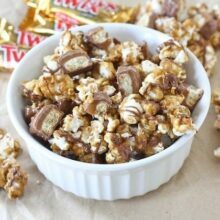 Totally making this popcorn! Pretzel bites?! Omg how awesome!!! I can definitely see how this would be addicting!! Mmmmmm, needing to try those pretzel bites! This looks to die for Maria!!! Yum! This would be great for any kind of party! OMG how lucky you get to go to an awards show after party!! What an experience! Please snap chat all of the stars! 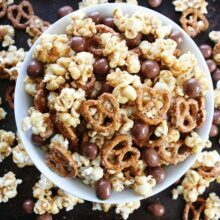 Pretzels in popcorn with chocolate covered pretzels bites too?! YAS! This snack wins out over salads any day! Where can you get those Lindt chocolate pretzels? I’ve looked at 4 stores now and nobody has them! I ended up making the recipe without them (still amazing) but I would love to try it again with the pretzel bites! Pingback: Easy Baseball Party Food Ideas: Quick Recipes & Treats!